During the restoration of the walls of the Stella della Segnatura, the restorers discovered damage to the portraits of Sixtus IV and St. Gregory the Great (on the Disputa), carried out by the mercenaries of Charles V during the sack of Rome in 1527. The names of Martin Luther and Charles V (famous Protestants) are etched on the fresco and provide a testimony of the sad events that decimated half of the Roman population. The Disputation of the Holy Sacrament (also known as the Disputation over the Blessed Sacrament or the Triumph of Religion), painted by Raphael between 1508 and 1511, represents Christianity's victory over the multiple philosophical tendencies shown in the School of Athens fresco painted on the opposite wall. Unlike the philosophers of the School of Athens (please see Related Works below), who are gathered together in a vaulted temple, the theologians of the Disputation make up the Church's architecture. They form one body, united in an ethereal apse flanking the Trinity and the Eucharist, which when consecrated becomes the body of Christ. The dynamic assembly painted in the Disputation of the Holy Sacrament, with the glorified Christ displaying his wounds in the center, can be seen as an iconographic reminder of universal judgment day. From this, it has been observed that the painting's message is primarily eschatological. There is a clear delineation between the Churches, as discordantly represented on earth compared to the harmonious portrayal in heaven. In Raphael's Disputation, we see not only simply Eucharistic adoration, itself a purely religious act, but a dynamic school of thinkers gathered around the altar, intent on penetrating the meaning of the mystery. The link to the School of Athens is clear enough here. These Christian doctors are just as animated in the search for truth as their pagan predecessors, in the School of Athens facing them, were. For Giorgio Vasari, the first commentator on the Disputation of the Holy Sacrament during the 16th-century, the intense intellectual activity painted by Raphael represents a collaborating in writing the Mass, and discussing the nature of the host upon the altar. The Mass, which makes signifies in an un-bloody manner the sacrifice of Christ on the cross, is the liturgical action in which, through the work of the Holy Spirit, the ecclesial community lives fully its conformity to Christ. The writing of the Mass also implies the tireless and age-old effort to understand, explore and better live the mystery of communion, entrusted to the Church, between heaven and earth, and God and man. If one is to adopt this perspective the Stanza della Segnatura reveals itself as a manifestation in which the Church is establishing itself in the modern era as a truly Catholic and universal Church. "Amid the clouds, and every eye will see him, even those who pierced him. All the peoples of the earth will lament him." The Disputation was the probably first fresco that Raphael, the then 27-year-old artist from Urbino, painted at the Vatican. It is also his most richly theological work. On another wall of the same papal library, facing the Disputation, Raphael painted another famous fresco, The School of Athens. Whichever of these two paintings was created first, there is no doubt that each inspired the other for the overall theme of the Stanza della Segnatura. In the spirit of theology, the image central to the painting is the Eucharist, which was obviously included with the intention of communicating something to the people of its day. Art scholars would argue that the dynamic theological assembly created by Raphael, with Jesus Christ displaying his wounds, was inspired by the reminder of the universal judgment. The day that Christ will emerge. The distinguished people depicted in the Disputation such as Pope Sixtus IV (the uncle of Pope Julius II) mix with the fathers and doctors of the early and medieval Church without any break in continuity. Raphael has created a scene spanning both heaven and earth. Above, Christ is surrounded by the Blessed Virgin Mary, John the Baptist and various biblical figures such as Adam, Moses and Jacob. God sits above Jesus, depicted reigning over the golden light of heaven. Below, on the altar sits the monstrance. The altar is flanked by theologians who are depicted debating Transubstantiation. Christ's body is represented in the Eucharist, which is discussed by representatives of the Church. Among them are Pope Julius II, Pope Sixtus IV, Savonarola and Dante Alighieri. 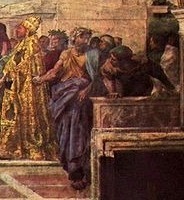 Pope Sixtus IV is the gold dressed pope in the bottom of the painting. Directly behind Sixtus is Dante, wearing red and sporting a laurel wreath. In the left hand corner, there is a bald figure reading a book leaning over a railing. This is the Renaissance architect Bramante. For Renaissance era visitors Raphael's Disputation of the Holy Sacrament would have resembled an eschatological situation announced earlier by the liturgy. In a brilliant design in perspective, the painting guides the viewer's eye to the altar, which is situated in a space below the half-circle of clouds upon which Christ and others are sitting. The Disputation's semicircular space seems to be like an apse, without walls or a roof, where two assemblies of equal size and dignity reflect and debate on the nature of Christ. 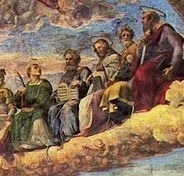 There is also a hidden, though not so well to be overlooked, design by which Raphael painted a great cross composed through the horizontal line of saints, prophets and patriarchs on the clouds and the vertical line of the Father, Son, and Holy Spirit, along with the Eucharist. Looking at the Disputation of the Holy Sacrament from top to bottom, it represents clearly the Trinity of the Church. 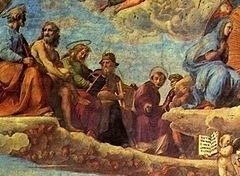 At the same time as contemplating this Trinity the horizontal in Raphael's piece show our (humanity's collective) future in heaven with Mary and all of the saints. 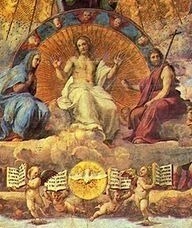 Where the two axes are crossed in the painting the unity between God and man is preserved through the image of Jesus Christ, the son of God, who is seated above the two schools. The four Gospels visible from the wings of the Spirit hovering above the monstrance suggest the unbreakable relationship between the Eucharist bread and the word of God. Raphael's mural painting techniques used permanent lime proof pigments, dispersed in water, which were painted on freshly laid lime plaster. His use of color is the closest to perfection as nearly any artist. During the restoration of the Disputation of the Holy Sacrament the colors were not lost. Similarly to Michelangelo, he creates lights and shadows within the tones of a single color and combines color in a dramatic manner. The Vatican Museum's restorers found the Disputation in relatively good condition. However, the wall behind the fresco had originally supported a fireplace, which was later removed and placed in the Stanza with the fresco. The heat from the fireplace created many cracks and caused the wall to swell. The people responsible for restoring the fissures used lighter tones in order to make them less obvious. Raphael's brush stroke included the use of Secco (the technique of painting a mural on dried lime plaster or retouching a fresco after it was hardened) and Intonaco (putting the final coat of plaster on the fresco while it is still wet) techniques. His mastery of brush stroke is evident in the idealized portraits that represent key figures from the Old and New Testaments, saints, Doctors of the Church, theologians and literary personages. The placement of the Holy Spirit below Christ and directly above the host and the altar evokes not only the affirmation of the council of Florence, but also the ancient formula for the Eucharistic epiclesis, in which the priest entreats God the Father to send the Spirit, the sanctifier, that the offerings may become the body and blood of Christ. For the sensibility of Raphael's time, the immediate impact of the message of Disputation of the Holy Sacrament was of an eschatological character. It showed clearly the relationship between the Church as militant upon the earth, and the Church triumphant in heaven. The viewer would have also noted the vertical axis defined by God the Father above, Christ who is displaying his wounds in the middle, and the Holy Spirit in the form of a dove descending in a nimbus of glory below Christ. So after the first impression referring to end times, observers would have made a theological reflection on the Trinitarian structure of the sacrament of the life of the three divine persons. For a visitor at the time of the Renaissance, the Disputation must have suggested an eschatological situation announced beforehand by the liturgy. Raphael's collective work on the Stanza della Segnatura, including the Disputation of the Holy Sacrament has always been highly regarded by the public and art critics alike since its unveiling in 1511. Raphael's methods of preparing to paint, of adjusting his ideas by reference to nature, of studying drapery and extremities separately as demonstrated in the Disputation and following works, were largely abandoned after his death by his pupils and not followed widely by many leading 16th century artists. However, by the end of that century those methods became exemplary in the artistic teaching established by the Carracci family in Bologna. The Stanza della Segnatura is therefore a body of work incorporated into the discipline of the art academies that spread across Europe in the following centuries. Upon the latest restoration a chronological issue has also been resolved with regards to the order in which the Disputa and School of Athens was painted. There had been a debate among art historians as to whether Raphael first painted the School of Athens or the Disputation when he began to work in the Stanza. 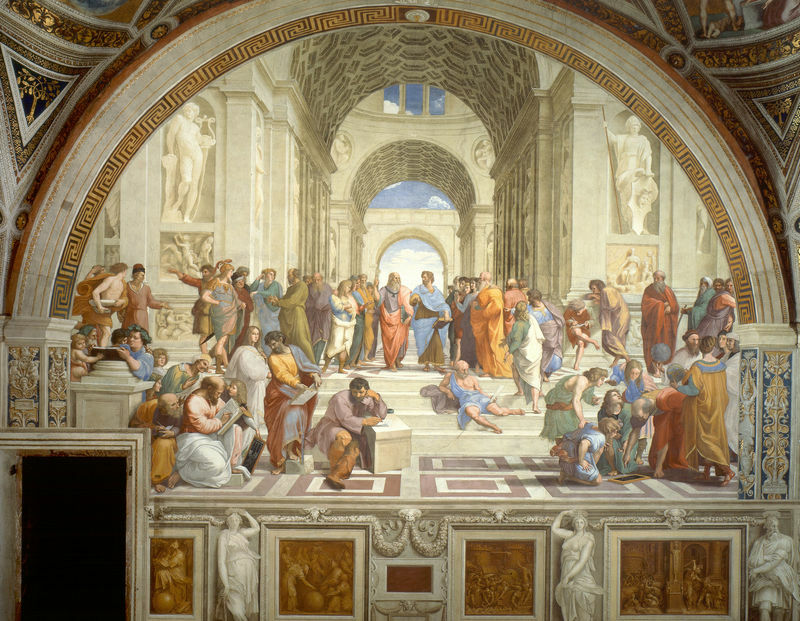 According to Professor Nesselrath it seems more likely Raphael began with the School of Athens. The restorers were also able to determine that portions of the decorations in the Stanza, such as the two monochrome chiaroscuro under the Parnassus were painted during the reign of Julius II, and not under his successor Leo X, as was previously believed. The Disputation of the Holy Sacrament remains in the room where it was painted and can still be visited today. The Disputation of the Holy Sacrament needs to be seen as more than this artwork itself. Indeed, while it may be the first image one sees upon entering the Stanza della Segnatura, it is not the only one and is therefore one piece of a larger puzzle. The School of Athens is painted on the wall of the room opposite the Disputation, and it is through this other fresco that one can comprehend the overall logic of the plan envisaged by Raphael. The two walls are intended as a single image through which the visitor is able to move. In between these two principal frescoes, the Renaissance era visitor would have felt in the transept of a church under construction (symbolic of the universal church), along the nave of which the great thinkers of antiquity moved towards the altar placed on the apse. Similarly, a humanist would have felt as if an age-old progress of the human spirit - from Greco-Roman paganism towards the present eternity of Christ glimpsed by the symbol of the Eucharist. 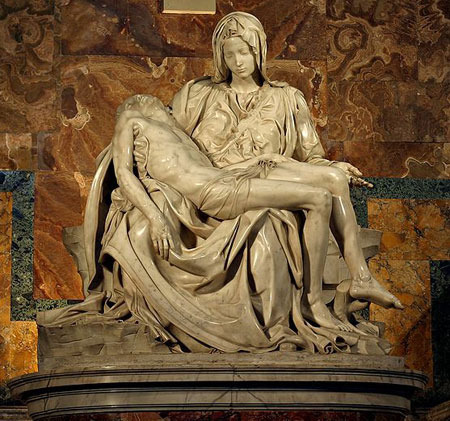 Given the location of where Raphael was painting the Disputation (the Pope's personal chambers) the pressure to accurately represent the Theological dimension of the Stanza della Segnatura would have been huge. 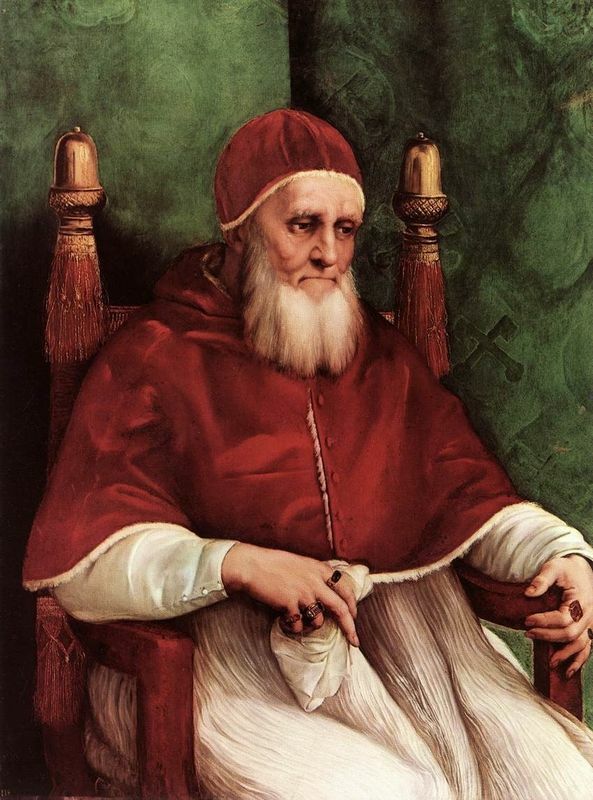 He was also under pressure to do justice to the faith that that Julius II had placed in him in removing Sodoma and putting the entire work into Raphael's young hands (he was only 25 years-old at the time of painting). In perhaps a sign of magnanimity Raphael included the other artist in his other Stanza works. Raphael gave himself the extremely difficult task of using the Disputation to define and explain the superiority of the art period over any others. This can be seen in the artistic interplay he used between the two walls of the School of Athens and the Disputation delineating a clear line between the thinking of the ancients and up to the overwhelming superiority of Christianity. Such a message no doubt had great resonance with the audience of the time. There are countless books written about Raphael and the High Renaissance. Below is a selection of recommended reading on the artist and his works.